Midnightsky Fibers: 4th of July Sale! 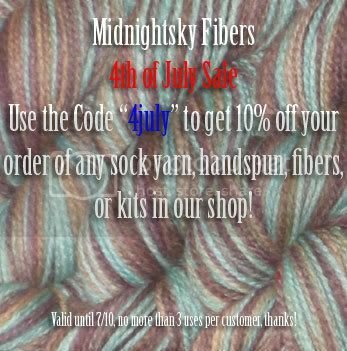 We are having a Fourth of July sale at Midnightsky Fibers! In fact we are so excited by our day off, we listed lots of items on etsy and eBay too! On Midnightsky Fibers you can get 10% off by using the code “4july” until July 10th. We made sure to make the sale last a couple extra days because we know everyone is busy having fun outside in this great weather we have been having today! You can buy any of our kits, sock yarns, handspun yarn, fibers, roving, and much more with the discount, limited to 3 uses (checkouts) per customer and available only for items in the Midnightsky Fibers store. We listed end lots of colors of sock yarn (shorter yardages than our standard 175 or 400 yard skeins) that is spun by a small mill just for us, and made sure that we had some of our infamous Magic Dragon kits available here as well as on eBay and in our shop.